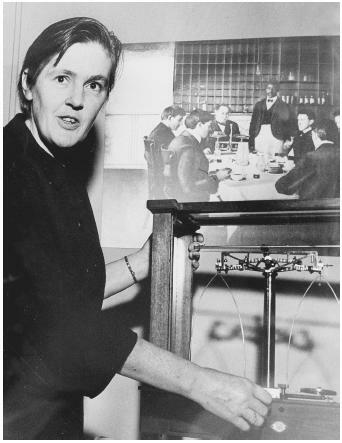 Pharmacologist Frances Oldham Kelsey, who rejected the use of the sedative thalidomide in the United States. metabolize the drug, due to the presence of an enzyme in their bodies, but that the embryos died, because they had not yet acquired this enzyme. They were among the first scientists to verify that some drugs that are safe for adult humans are dangerous to human embryos. Oldham and Kelsey married in 1943. Frances Kelsey earned an M.D. degree in 1950; the Kelseys then moved to South Dakota, where Frances practiced medicine part time, taught pharmacology, and reviewed scientific articles. In 1960 the Kelseys moved to Washington, D.C., where Frances was offered a job at the Food and Drug Administration (FDA). Her job was to evaluate applications from drug companies that wished to market new drugs. She had sixty days to evaluate each application. The first drug she was asked to evaluate was thalidomide, a sedative prescribed to pregnant women for relief from morning sickness. The drug had been marketed to the masses in West Germany, where it had first been developed, and in many other countries, including Canada. Frances Kelsey and the pharmacologist and chemist who assisted her in the review of thalidomide were immediately concerned that the information that had been provided by the drug firm did not prove the drug's safety. The company was asked to resubmit their application. At around this time, Kelsey began to read reports that some patients who had taken thalidomide had developed peripheral neuritis, a disease whose symptoms included a painful tingling in the arms and feet. Kelsey rejected a second application. Remembering her earlier research with quinine, Kelsey wondered what thalidomide might do to the developing fetuses of pregnant women. The drug company continued to pressure Kelsey to approve its application, even contacting her superiors at the FDA. She continued to reject their applications. In 1961 European pediatricians began reporting an epidemic of phocomelia among newborns, a developmental anomaly characterized by short limbs, toes attached to hips, and flipperlike arms. By November 1961 a German pediatrician had determined that the teratogen (a substance causing one or more developmental abnormalities in fetuses) was thalidomide. From 1957 to 1962, more than 10,000 children in forty-six countries were estimated to have deformities owing to their mothers' use of thalidomide during early pregnancy. By her insistence on getting thorough, all-sided information on drug safety before drug application approval, Kelsey had prevented the use of thalidomide in the United States. On August 17, 1962, President John F. Kennedy presented Kelsey with the President's Award for Distinguished Federal Civilian Service, in recognition of her having prevented (almost single-handedly) a national tragedy. In late 1962 the U.S. Congress passed the Kefauver–Harris Amendments to the Food, Drug, and Cosmetics Act (named after the senator and congressman who sponsored the bills in Congress), which gave medical officers at the FDA more power. The amendments outlawed drug testing on humans without informed consent, and mandated that a new drug could not be approved until scientific evidence had established that the drug was safe and effective. As of 2001 Kelsey still worked at the FDA as one of their leading compliance officers. In 2000 she was inducted into the National Women's Hall of Fame, whose Web site states: "Kelsey is both a woman of courage and one of reason—demanding of herself and others in her profession high standards of science and integrity." SEE ALSO Enzymes ; Teratogen . Bren, Linda (2001). "Frances Oldham Kelsey: FDA Medical Reviewer Leaves Her Mark on History." FDA Consumer 35(2):24–29. Also available from http://www.fda.gov . Truman, Margaret (1976). Women of Courage. New York: William Morrow. National Women's Hall of Fame. "Frances Kathleen Oldham Kelsey, Ph.D., M.D. (1914–)." Available from http://www.greatwomen.org .